Congratulations to Larry “CJ8Larry” for October 2015 JOTM Winner! 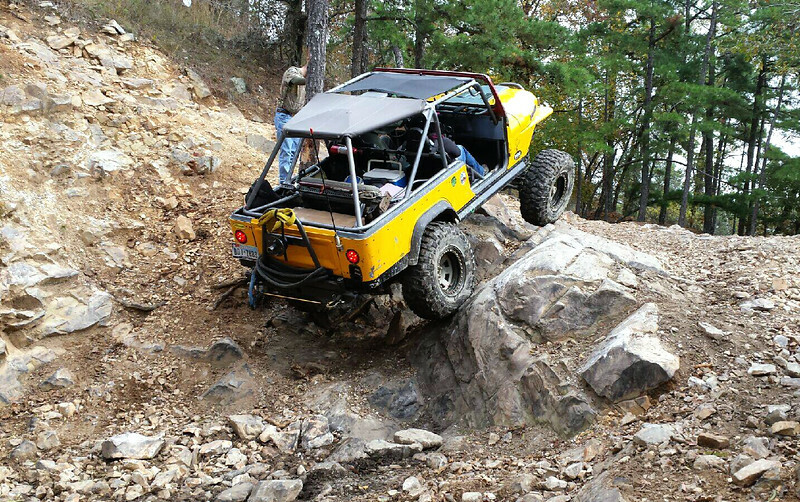 This picture was taken back in May during the club run to Hot Springs ORV park. The trail / obstacle was Bailey’s Boulders. The second half of Bailey’s boulders has always given me fits in the past but this time someone (I think it was Redneck Ron?) suggested a different line to hug the left side. I tried it and the old Scrambler just walked right up it. I think the new Krawlers helped a little too. It was one of my more proud Jeep moments. The Jeep is a 1981 CJ-8 Scrambler running a Ford FI 302 / C6 auto / Dana 300 with 4:1. Out back is a ford 9″ with a Detroit locker and 4:88 gears. The front is a Dana 44 with a new Grizzly locker, 4:88s and Yukon Chromoly shafts. Tires are 37″ BFG blue label Krawlers on 17″ Allied beadlocks. Thank you for the votes. CJ’s Rule! ← September 2015 JOTM Winner!